A LAST chance bid to scrap the controversial Whitesands flood defence scheme was shot down on Monday. At a special meeting of Dumfries and Galloway Council the Conservative group tabled a motion to remove the scheme from the local authority’s capital budget, urging the council to reconsider a new scheme that would meet with public approval. But the motion was defeated by 26 votes to 14, with economy, environment and infrastructure committee chairman Archie Dryburgh saying he was “astounded” to see the project appearing before full council again at this stage. The local authority agreed in June this year to confirm the scheme without modifications and refer the decision to the Scottish Government. Members also requested that Scottish Ministers call in the Scheme and hold a Public Local Inquiry (PLI) to allow those with outstanding objections to raise these matters with the Scottish Government. Conservative group leader Ian Carruthers first tabled a motion to scrap the scheme in June 2017 but was defeated, while a second attempt earlier this year failed after a motion was ruled incompetent. 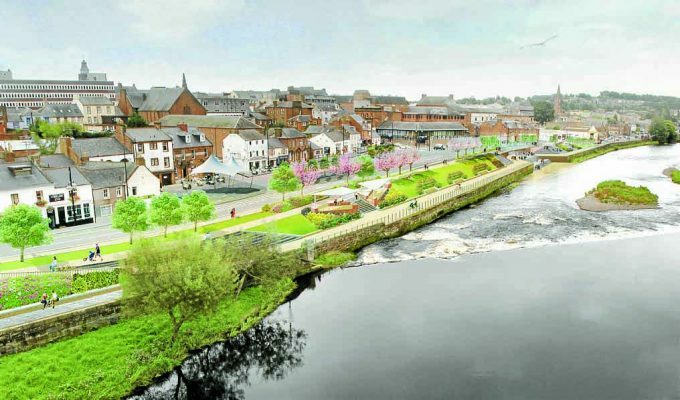 A report circulated to councillors this week explained that the initial estimated cost of the Whitesands flood prevention project was £25 million, with the Scottish Government confirming that they will fund up to 80 per cent of the cost. Speaking at Monday’s meeting, Mr Carruthers said he believes costs for the project will go up and could reach a total of £40 million. He explained that removing the scheme from the capital investment programme would free up £2.853 million which could be reallocated to other projects, and would allow the council to redesign a scheme that would meet with public approval. Mr Carruthers said: “Anyone I have spoken to about the scheme does not want it. But deputy council leader Rob Davidson explained that the local authority had already committed more than £2.1 million to the project and would have “virtually no chance” of getting it back if the scheme was removed. And councillor Adam Wilson said there are “businesses that desperately want action”, while fellow councillor Jim Dempster described the Conservative group motion as a “delay tactic”. The PLI on the Whitesands scheme is due to begin on November 6 and could last up to one month.